May their ballad-heavy reputation forever be banished into oblivion — REO Speedwagon is much more hard-rocking — and thoroughly enjoyable — than you remember. 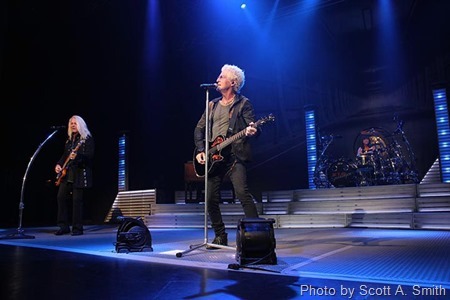 Of course the softer side of REO Speedwagon shows itself on the stage, as it did Nov. 12 in front of a sell-out crowd at the Joint inside the Tulsa Hard Rock Hotel & Casino, but a gritty edge never really left the venue’s spotlight. The band — singer/guitarist/pianist Kevin Cronin, bassist Bruce Hall, keyboardist Neal Doughty, lead guitarist Dave Amato and drummer Bryan Hitt — tapped into the same kind of wonderful energy that permeated throughout REO’s 1970s LPs. The slight funk of “Music Man” and the prog-rockish flavor of “Golden Country” were among the evening’s splendid ingredients. Even REO’s ballads shed some of their usual gloss on the Tulsa stage. “Take It On the Run” became almost anthem-like, with Cronin fretting the acoustic, simple-yet-majestic guitar intro with only his left thumb. “Keep On Loving You,” always a good song with a killer guitar solo, had a bit more bite in Tulsa than it did on its original 1980 studio incarnation. Always a show-stopper, “Ridin’ the Storm Out” entered the set after Hitt thrashed on a giant gong. The number showcased a perfect balance between hard, driving rock and tight, hummable melodies. At age 64, Cronin bounced all around the stage in young-man fashion, displaying his piano and rhythm-guitar abilities while his rock-and-roll preacher persona acted as an intriguing emcee. The 110-minute set was topped off by unexpected, downright riveting covers at encore time. Paying homage to his previous stint in Ted Nugent’s band, Amato let his six-string abilities fly into hyper-drive fashion during a shortened (but still great) version of “Stranglehold.” Equally surprising was Amato at the lead-vocal microphone for the song. Not entirely different than Nugent vocalist Derek St. Holmes’ pipes, Amato’s voice sounded strong and purposeful atop the grinding instrumentation. Next up was a terrific take of Tom Petty’s slightly under-appreciated “Listen to Her Heart.” The guitars of Cronin and Amato rang and chimed in true Byrds fashion as Hall’s bass pulsated in deep-note territory. Like they did on every song that came before, all five musicians bursts with a refreshing energy on the Petty tribute. Cronin also gave brief details about REO’s humble, stationwagon days as a bar band in Champaign, Ill.
It’s been said by this writer in the past and it must be said again. 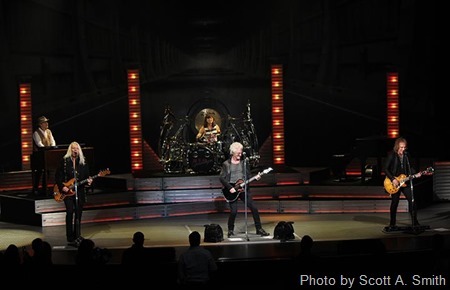 If a smile doesn’t cross your lips and you don’t feel the urge to cheer and stand whenever REO Speedwagon starts playing “Time For Me to Fly” in concert these days, you have no soul – or pulse.